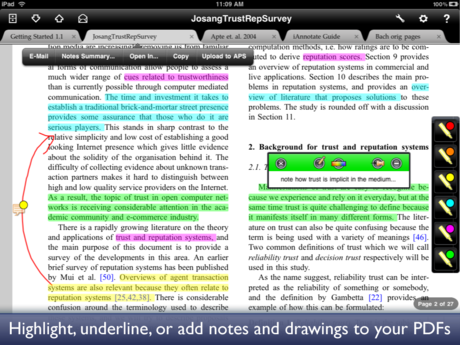 It used to be textbooks that were compulsory at uni, now it’s iPad apps. Stanford Medical School provides all its first year students with a free iPad and now they are providing them with free apps as well. And there’s nothing specialist or medical about it. First year medicine students will now be issued with the iAnnotate PDF app which lets you annotate PDFs – improving live note-taking and automatic distribution of lecture materials. No more scrabbling for the photocopies at the end of class. They explain: iAnnotate is a complete annotation solution that gives students and other professionals the ability to take notes, highlight and underline in documents and diagrams with the drag of a finger. iAnnotate eliminates the need for voluminous printed texts and easily consolidates and organizes notes and documents. Teachers can quickly grade assignments, and share annotated diagrams, charts or syllabi. Students can easily email and share notes on PDFs to their study groups. You can sync you iPad screen to a computer or another monitor, you can search all PDFs for a keyword and you can share marked PDFs with friends. Apple have been onboard with education from the beginning and they have a deal whereby institutions can bulk-buy apps. We expect to see this spreading out to businesses soon. I have gone through to loads of blogs for learning and I can state that it is one of the premium educational sources.